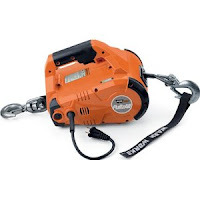 The "PullzAll" 685000 corded electric winch (110 V) is a light and powerful portable winch for performing tasks such as pulling small tree stumps and shrubs, or hoisting items in the garage or workshop. Though the winch may run a little slow due to it's low gearing, and perhaps the cord may be a little short, but it does have an overload - auto reset to help prevent or reduce internal malfunction. Also has variable speed control, and forward - reverse feature to help control movement, hence reducing the need for manual input. So you can easily reduce manual labor and time, to achieve an easier and quicker lifting or pulling task with minimum effort. There are several online stores, which include Amazon Com. There are also various related PullZAll units, such as the 88500 120V AC, 685005 24V DC cordless electric pulling tool, 685014 rigging kit, and 885005 hand-held cordless pulling tool. But of course visit the Warn web site for information, such as authorized where to buy dealerships (includes map for worldwide dealers), warranty statements, newsletters, product registration, authorized serve centers, and product literature such as user guides and industrial brochures for download (pdf files). Also can download the product catalog for all units. Also supply pulleys, trolleys, hoists, load binders, power pull extensions, web strapping, 4 ton rope pullers, amongst automotive, farm, power, building, and construction equipment. Supplies a few models, rigging kits, anchor plates, utility winches, safety wear, power tools, workshop supplies, builders hardware, lighting, ranch supplies, cabling, and more. Also distribute several categories for Industrial supplies, home and garden, and tools and hardware. This includes other models to compare, e.g from Dayton, Dutton-Lainson, Thern, Ramsey, Miller, Superwinch, and others. Includes electric, planetary, manual, industrial, and ratchet units. Warn's PullzALL electric winch (i.e. corded) would be handy around the home (e.g. light to medium construction or renovation) or garage, but with careful hoisting or pulling- particularly for it's rated capacity. It's relatively compact design would make it useful and easy to lift in tight spots, but of course need to remember it's lifting rating, so as not to use it for single larger tasks (i.e. heavier lifting) or time consumer lower rated power lifting tasks. But certainly a useful Warn manufactured, portable companion electric winch for suitable demanding and labor intensive tasks. Therefore in the garage, home renovations, job construction sites, and outside on farms, forestry and garden one can implement alternative methods of moving objects and materials. That is the good blog page I just surprise for what reason the other one of that arena really do not find this unique. Seen this unique put up seems to have made it easier everybody protect much time from perusing various corresponding items mention a few see whatever I just was looking for. Nowadays follow-up Payday Loans Oceanside Thanks a lot!